Make a leather braided bracelet in the style of the Sami people of Lapland, located in Finland, Northern Sweden and Norway. These bracelets are traditionally made of reindeer leather and are worn by both men and women. Sami bracelets come in many different colors, and, if you make your own, you can choose whatever colors of leather and leather cords you want. Measure around your wrist with a tape measure and add 1 inch to this length. Cut a strip of leather 1/2 inch wide and the length you determined for your wrist. Measure six 1/8-inch thick leather cords to the length for your wrist and add 6 inches. Glue the bottom of a 1/2-inch wide button to one end of the strip of leather with epoxy adhesive and wait 24 hours for it to harden. Cut a 1/2-inch long slit into the other end of the leather strip with the tip of a utility knife. The slit should be just slightly smaller than the button. Apply epoxy adhesive to the end of the leather strip right after the edge of the button and press the ends of the six leather cords into the glue with a pair of tweezers. Make sure the edges are aligned. Wait 24 hours for the adhesive to harden completely. Separate the cords into three groups of two and braid them. Make sure the cords lie flat against the leather strip as you braid and add a dab of glue after every inch that you braid to secure it flat against the leather. Glue the end of the braid to the leather strip right before you reach the slit. Wait 24 hours and trim any excess cord from the end. Put the bracelet on your wrist and slip the button through the slit to secure it. 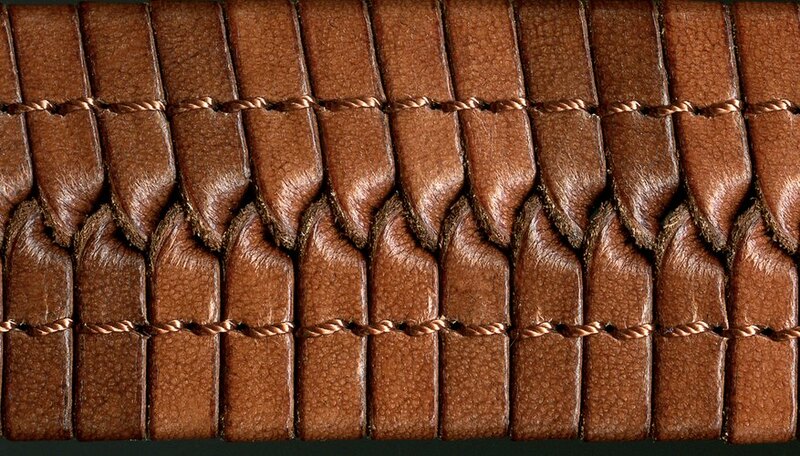 Mix different colors of leather cord to create additional patterns within the braided portion of the bracelet. Don't wear the bracelet in water or the leather may come unglued.